I AM SO EXCITED!!! K built me a second raised garden bed so that I can plant even MORE vegetables this year. He knows that my energy is waning but he is wanting me to keep active so that my lung function stays stable. Plus, staying active makes me happy even though it takes a lot more energy. So, this year, K has committed to helping me with my garden whereas, last year, he told me it would be my responsibility to take care of it. I planted 8 seed potatoes this year. Carrots, Broccoli, & Herb garden. I know what he’s doing and I appreciate it very much. He’s getting more involved in hopes that I will be encouraged to keep moving which has declined over the last 6 months. In fact, we even went out clothes shopping for me last week. I normally hate shopping but I hadn’t had any substantial new clothes in years. I’m someone who will wear what I own for years before I become willing to shop for new stuff. Shopping makes me tired and again, K was so instrumental in helping me make shopping for clothes really fun. He helped me pick out clothes (because he’s SO good at! haha! ), came in the dressing room and helped me get clothes on and off if I needed it, went out for exchanges for different sizes, told me to rest when he saw I was getting tired, AND told me, as I was showing off each piece of clothing, how much he liked it or asked me if I liked it or will I be comfortable in it. You see, I have scoliosis and clothes don’t always fit right. It can discourage me a lot when I go out clothes shopping. So having K there in the dressing room giving his opinion was SO helpful. He’s never gone into the dressing room with me before. So, yeah, he’s noticing and really trying to make a difference in my life and our happiness. P.S. I just told K that I need a new Rubber Chicken. *sniff* Klondike’s (my current chicken) finally broke his neck *cringe*. It’s so sad because he’s been on some amazing adventures! When I get a new one, I will need help with naming him (or her). I’ve never had a girl rubber chicken before! Yes, I know I’m a bit strange about these chickens but they are our Road Trip Mascots. They go on our vacations with us for good luck. *sigh* So far, over the last 29 years, we’ve had Poke, Poke Jr., Mr. Chicken, & Klondike as our mascots. It really is a fun thing to do. haha! Like I’ve always said, finding something fun to distract me from my health, no matter how silly it can seem, is how I deal with life. There are different reasons for a person who may require a sleep study. Sleep Apnea is one of them. I’ve had quite a few sleep studies dating all the way back to 1993. Even though I was already on oxygen at night only, my lungs couldn’t work well enough while I slept to blow off the CO2 that my body was retaining. My breathing was too shallow. I would have really bad dreams and I’d stop breathing while I slept most nights and the problem was only getting worse. I was seeing a Pulmonologist in Dallas, TX, in 1993, who realized that my scoliosis played a large role in my breathing problems. Because my ribs are so deformed from my scoliosis-curved spine, it reduced the lung capacity that I had to breathe. Twenty-four years ago, my lung volume was approximately 25% of what a normal, healthy person my current age back then. Today, it measured at 16% at my annual physical. So, over the span of 23 years, my lung capacity has lost about 1/3rd of it’s former volume. Now, if you add the complication of Pulmonary Hypertension to the mechanical difficulties of Restrictive Lung Disease (from my deformed ribs due to Scoliosis), my health becomes difficult to treat. Now, add heart complications. I was born with an ASD (closed on its own) and an VSD (surgically repaired at the age of 10 years old) but also currently have trouble with Ventricular Tachycardia & SupraVentricular Tachycardia. This is the challenge my doctors face. How do you treat one problem without it affecting the others? The answer? Very, very careful trial and error. I make myself heard and understood. I carry test results from one doctor to all my other doctors. We are a team. So, when I was starting to have a noticeably difficult time breathing earlier this year, I decided to systematically figure out what is causing this large step back in health. I started with my PH doctor. Then went to my Electrophysiology-Cardiologist. After that, I went to my family doctor to bring him up to date. Next, I went to my Pulmonologist who follows my bipap machine. We set up a sleep study. Not my favorite thing to do. I hadn’t had a sleep study since 2009. Maybe I just needed my bipap setting tritrated and that would solve everything… but I don’t think it will. I’m still thinking it has to do with Tikosyn.. the new cardiac medicine I started taking in place of Cordarone. Next week… I see my normal cardiologist for an ECHO and to ask for a second opinion about this Tikosyn. I’m not giving up until I’ve tried everything to figure out what triggered this breathing setback. I don’t want this to be my new normal. Sure, it’s nice that K does all the grocery shopping on his own but sometimes we have fun together doing it. It just makes me too tired now. If you’ve never had a sleep study done and you’re curious about them because you have been told you need one, well, wonder no more! Here I am all wired up for my sleep study. There are a LOT of wired that are attached to your head, arms, upper chest, and legs. Don’t forget a few weird places like under your chin and next to your eye. Those get a little itchy! You also get an upper chest band and an abdomen band that monitors your breathing. I was able to bring my 3 pillows that I use and my own bipap mask because I already use a bipap. There is a dress code for pajamas. Some sleep studies are done in the hospital and some are done in a stand alone building. If you are to have a sleep study and you use oxygen 24/7, be sure to mention that and take a tour of their “bedrooms.” If you are doing a sleep study outside a hospital and you use a high flow of oxygen 24/7, like me, make sure they can accommodate your oxygen needs. I had to bring my splitter so that I can use two oxygen concentrators together; each set at 3LPM to be able to have enough oxygen while doing my sleep study. Once you are in your sleep study, if you are having trouble breathing or with the mask they gave you to try, speak up. Let the technician know what’s going on. They’ll try to help as much as they can according to the doctor’s orders. Make sure you understand what your doctor wants to try during the sleep study before you have your sleep study. They really want you to be comfortable so that you can sleep as best as you can. Tell them how you sleep in bed. They’ll want you to try to sleep on your back for a while but my tech let me roll over (which was pretty hard to do with all the wires!) onto my stomach to try to fall asleep. Seriously, I’d love to hear your comments, experience and advice for future sleep study patients. I know that the Bipap or Cpap machines can be a challenge at first to get use to but, once you do, they can help by improving the quality of your life… at least your sleeping life. 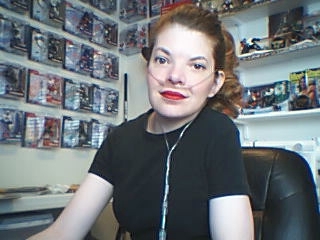 *wink* My bipap machine has kept me alive for the last 23 years. I’m glad I didn’t give up on mine. Gearing up for the PH International Conference and What’s up with my heart? I’m actually impressed with the newer halter monitor that I’m wearing. It’s cool! I get a “Sensor” that has 3 leads and I wear it around my neck from an attached lanyard. Plus, there is the “Monitor” which is like a cellphone. When I have an “episode” with my heart skipping, I get to push a button on the screen of the monitor and go through a few questions about: What is happening? (I check: Heart skipping), What’s your activity? (I click either resting, mild, moderate, or heavy). So far, I’ve not had to click on heavy activity. I’m not crazy! haha! It’s raining and humid here. So, my activity is limited to indoors, low to minor-moderate activity because I get tired a lot faster in this kind of weather. There’s no telling what my carrots look like in my garden. I only have one orange left on my dwarf orange tree. The wind blew the others off. If you want to see the many pictures of Klondike’s Adventure in Germany, you can view them all here… you don’t need an account to view them. My sister really did show my rubber chicken a good time so far. His trip is coming to an end soon. I’ll be meeting my sister and her family when they fly through on their way home. Maybe I should make her some more cookies! Shh! It will be a secret! Oh yes.. we are going way, way, way back in the past of my life with this picture. Get your plaid bellbottoms on and step back into the 1970s with me for a bit. This is the house that I grew up in for nearly 10 years of my childhood. If you look on the right side of the picture, you will see the farmer’s corn field that we lived behind and also the forest of Short Story part 1 that I wrote about. This house has changed colors while I lived there from blue to green and back to blue again. It’s all wood too, which isn’t very helpful since we lived in the Tornado Alley. I can remember many of times that my sisters and I were woken up in the middle of the night to run to the closet under the staircase because a tornado was coming. My parents bought this house when I was a toddler. Since I had so much trouble with being short of breath and heart trouble, my parents put my bedroom downstairs in a room that was meant to be an office or something like that. My bedroom door was actually a set of french doors. I thought I was pretty special because I had a bathroom that connected to my room like Mom and Dad! Everyone else’s bedrooms were upstairs. My short stories that I posted on my blog are based on my memories of this house and the fun I had here. I guess you are wondering about the surrey. My little sister and I (and I think that my cousin is the driver!) are who you see in the picture. In fact, you can see the back of my grandpa’s head in the garage entrance. He’s the one who built the surrey from parts he found and my grandma had sewn the fringed cover. She has always loved crafts and sewing which is where I think I got my craft bug from. This surrey was awesome and it got a lot of action out of us kids! 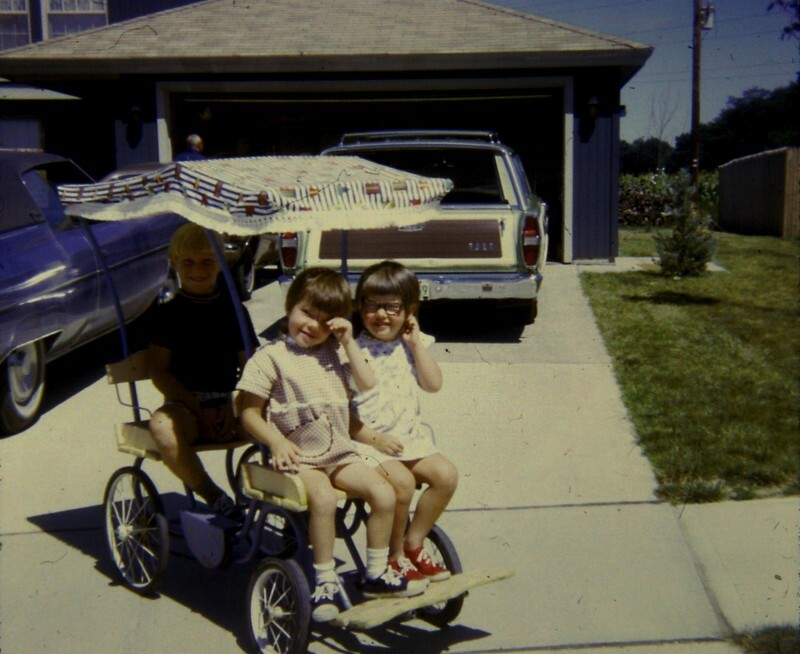 My little sister did most of the pedaling because I would tire out too fast. We even rode in it during a parade which was a VERY long and tiring pedal job! I think my mom had to make a lot of my clothes or shirts because I wore a Milwaukee Back brace at this age too. So, shirts had to be big enough to fit over the brace and the neck opening had to be a little more roomy for the top of the brace. I always had to wear an undershirt because I wore one beneath the brace to help prevent rubbing my skin raw. My dad would take my brace off once a day and that’s when he used witch hazel on the pressure points where the brace would rub. Usually my hips, my right shoulder blade (scapula), and under my neck. For a long time, there was a dark brown bruise-like discoloration under my chin. My chin would always be up against the chin piece of the brace. You can see the brace I’m talking about here, under The Braces section of my blog. Scroll to the bottom of that page and the Milwaukee Brace will be there. If you haven’t guessed already, I am the one with the blue shoes! Try not to laugh over my hair cut. It had to be short or my hair would get caught in the screw that closed the top of the brace which is in the back. I may have had a lot of doctor appointments and trouble during the winter with catching pneumonia occasionally, my life as a child was a good one. I know I mentioned on my Facebook page that I was going to write an “About Me” page. I plan to do just that. There’s so much to say. I’ve experienced a lot in my life starting from the very day I was born with serious health problems. In fact, I was told that when I was born, my father cried because I was not perfect. I know all expecting parents wish for a healthy baby with ten fingers and ten toes. Well, I came out 3 weeks late and had eleven toes. That was just the beginning of a long battle for surviving. So, if you want to know what kind of childhood I had growing up with pulmonary hypertension, cardiac & breathing problems, & scoliosis follow my blog because I’m about to pour it out in this blog of mine. My life has shown me that miracles do happen. After that fiasco, I decided to get out of bed. I immediately realized that I have a missed text on my cellphone. It said, “Wait for me to go grocery shopping…” I was like.. “SWEET!” My husband remembered about today’s errand! (What a good man, huh?) When grocery shopping is scheduled, I tend to rest all day until we go. It’s a real energy drainer for me. I decided to find a movie on Netflix to watch but the one I selected was pretty intense. By the end of the movie I was feeling a huge headache and nauseation coming on fast. It was only 12:30pm and I was heading back to bed. Obviously, my body needed to really relax. The only way I can do that is to rest while using my bipap machine which I use with oxygen. Thankfully, by the time my husband got home from work, my headache was mostly gone to the background. K knows that when I have a headache like that it means that everything I do has to be done much slower. My oxygen saturation will drop fast and my heart rate will increase easily. A migraine affects my whole body and it is a drag. When I need a rest, K will tell me to hop on the end of the grocery cart and he’ll push me up and down the aisles. Just like how everyone did as a kid! It’s great! I am not embarrassed at all to do it either! Who cares that I’m 43 years old and riding on the end of the cart. At least I’m out of the house and being mobile. Am I right, or what??? My husband once told a doctor that how I approach not being able to do certain things I was able to do before is to find another way to do it. If something makes me really, really tired by doing it, I will find some other way to do it. Here’s a simple example: I have really long hair (down to my waist) and it’s very tiring to wash it. So, I bend over at the waist in the shower and scrub my hair instead of having to keep my arms lifted up to my head the whole time. Since I have scoliosis, it’s hard to keep my left arm up reaching my head anyway. If a chore is too taxing for me to do it all at once, I will break up in steps. Vacuuming and cleaning a bathroom tub are the hardest for me. I’ll vacuum one room and then sit down for a bit and then do another room. I may not even be able to complete all the carpeted rooms in my house in one day. I just do what I can do and be happy with that. My next biggest project will be to organize my craft room. I hope everyone has a very Happy Valentine’s Day!